This season, we celebrate the union of two seemingly disparate fruits into a single tasty treat, the PLUERRY! This is a cross between a plum and a sweet cherry that goes to a whole other level. Sweet, juicy with an entirely unique flavor, this is a must-have for the fruit connoisseur! SWEET TREAT (above) has been available for the past two seasons and now CANDY HEART (left) joins the clan. 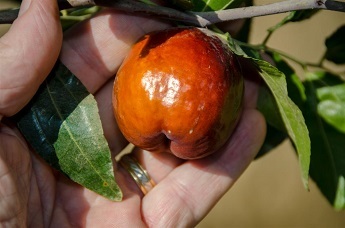 Consistently finishing in the top three in Dave Wilson Nursery tastings, this heart shaped, intensely flavored fruit is larger than Sweet Treat with dark red, speckled skin and amber and red flesh. Both Pluerries have an extended hang time, with fruit becoming sweeter and more intense the longer it stays on the tree. Candy Heart is yet another amazing creation of Zaiger. And we would like to emphasize once again that none of Zaiger's interspecific hybrids are genetically modified in any way. 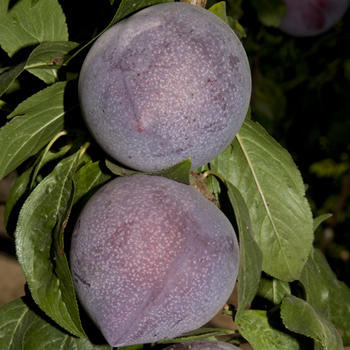 Another new introduction from Zaiger is SUMMER DELIGHT APRIUM with great apricot flavor and very juicy flesh. This variety ripens quite late in late July to early August. It joins COT-N-CANDY, FLAVOR DELIGHT and LEAH-COT (above), extending the Aprium season from early June to August! 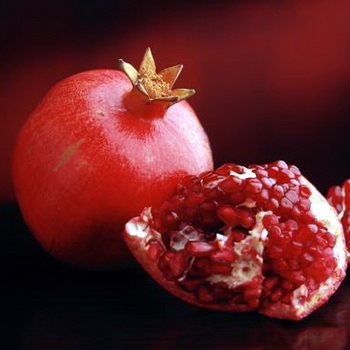 We also have two new POMEGRANATES for this season. ARIANA has medium to large fruit with red skin, dark red arils and very soft seeds with a great sweet-tart flavor. CRANBERRY, amazingly enough, has cranberry red fruit and a rich, sour juice. Both would make an excellent addition to anyone's orchard. In light of the continued popularity of MULBERRIES, we have expanded our selection to include WHITE PERSIAN, a Morus nigra species. 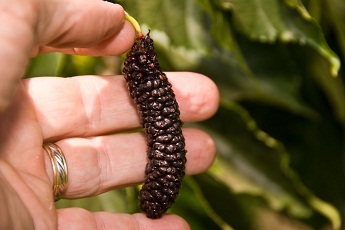 In addition, the ever popular PAKISTAN COOKE'S SELECTION (left) is now available in both bush and tree form and a larger supply of WHITE MULBERRY (above) is expected this time around. JUJUBES also remain in high demand and we are pleased to offer SHANXI LI (left) with extremely large sweet fruit. This variety is good in hot desert areas. 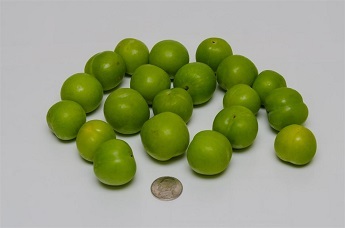 PERSIAN GREEN PLUM, a favorite springtime treat in the Middle East, is a small sour plum that is eaten when small, green and crunchy, usually seasoned with salt. The fruit can also be left to ripen until sweet and juicy. Not completely new, but absent for a few years, is AUTUMN BLISS RASPBERRY, a variety similar to Heritage with great disease resistance and cold hardiness. Home brewers, take heed! 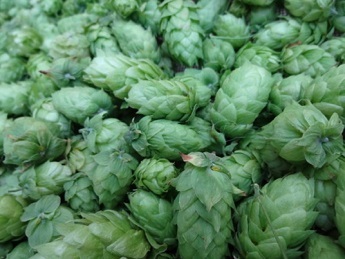 We are stocking two varieties of HOPS this season, both widely used in beer making. 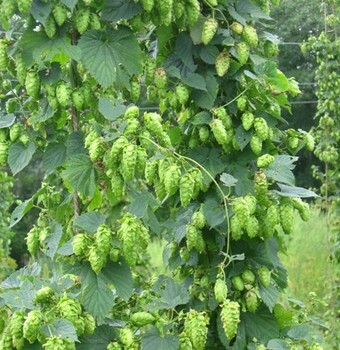 CASCADE (left) is ornamental with its variegated leaves as well as being an excellent addition to lagers. CENTENNIAL (left) is used to add flavor and aroma to pale ales and other types of beer. Both are cold hardy to zone 3. Please be aware that hops go completely dormant during the winter, so you will receive what looks like a pot of soil, so do not be alarmed! A final note regards the dwarfing rootstock for apples. In the past, we have used M27, but on the recommendation of the fine folks at Dave Wilson Nursery, we are changing over to GENEVA 935. Geneva is very cold hardy, precocious, disease resistant, produces large fruit, rarely suckers and keeps trees at eight to ten feet. Wow! 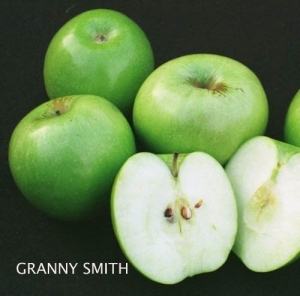 We have added GRANNY SMITH and HONEYCRISP on Geneva, as well as changing over ANNA, DORSETT GOLDEN, FUJI, GALA and PINK LADY to this outstanding new dwarfing rootstock.